Blog Not Embracing Native Advertising? Beware of What's to Come. Native Advertising is the future and the sooner you get on board with it, the further ahead you’ll be. I found this article and thought it would be great to share. The author delivers some great insight into the different advertising roles and their relationship with Native Ads. As always, please leave us any comments or questions below! We have a serious problem in content marketing and I’m going to point fingers today. For the last several years, there’s been a steady drumbeat in our industry to be more strategic and to embrace content distribution. The latter seems to have been neglected due to corporate silos, budget misallocation, fear of trying something new, and other excuses. It’s no secret why this drum beat exists. In fact, a major reason was highlighted on this very blog in January of 2014 – Content Shock. I once asked an English friend why he invited so many Americans to present at his conference. He told me that Europeans believe that innovation travels on the jet stream and it starts in the US. That may or may not be true regarding technology, but when it comes to Native Advertising acceptance and execution for content distribution it’s far from true. My time in Europe has shown me that this region is much further ahead in the adoption of Native Advertising for content distribution. In fact, I’ve even seen successful agencies that only do Native Advertising. Add to that, publishers are some of the leading sponsors at every content marketing event I attend. In the US, I’ve seen two publishers sponsor an event once … and I attend dozens a year. The definition of insanity is doing the same thing over and over and expecting different results. That means we (marketers), native ad tech, brands, publishers, thought leaders and media buyers are insane. That’s right. . . insane.
. . . and today I’m taking a stand. You can lead a horse to water, but you can’t make him drink. If any of the below descriptions sound familiar then this post is the water. I implore you to drink it. . .
Did you know that for every one dollar spent on creation, a television advertising executive spends five dollars on distribution? Based on my research, content marketers spend one dollar on distribution for every five dollars they spend on creative. Nobody flinches when the TV guy walks in and asks for 5x to promote his creative, but content marketers are left begging the PPC/media buying team to please promote their content. You can’t separate creative and distribution at the top of the funnel and expect to be successful. These folks are really good at promoting mid to bottom-funnel content on those channels, but you can’t separate creative and distribution at the top of the funnel and expect to be successful. That’s why there’s so much native click-bait and false promises all over the web today. These people aren’t beholden to the same KPIs and metrics we care about, either. Content marketers need their own distribution budgets and staff to execute. If not, then distribution should be as close to creative as possible. This group is partly to blame for the current situation we’re in, too. Most of the tools available today are built to serve media buyers, not content marketers. Most use the language of media buyers, display, and PPC folks. Their KPIs, for the most part, are devoid of anything we content marketers are interested in measuring or tracking. We care about engagement, conversions, and subscriptions. Who cares about impressions and clicks on top-funnel content? If it’s not prompting engagement, it’s worthless. As Mark Schaefer wrote in The Content Code, the value of content that is not seen and shared is zero! 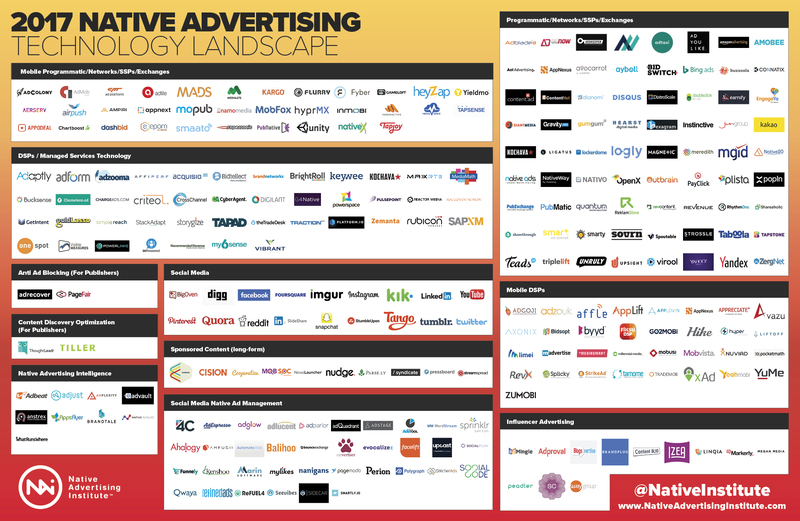 There are nearly 300 Native Advertising technology companies. It’s high time you start catering to marketers. We’re where your growth is going to come from. For content marketers, we need to embrace what we have available and stop being fearful of this technology and media buying foreign language. We need to fight for our budgets and educate ourselves. It starts with understanding the native advertising landscape. That’s why we put this custom research together and plan on updating it annually. It’s not as complicated as you may think. Embrace it. Your legacy silos and misallocation of budgets are partly to blame for poor content performance. I had half a dozen folks come up to me at my Content Marketing World session and tell me they get it, but they can’t get any budget to do content distribution. It’s owned by the media buying team. This must change. If the TV exec can walk out of an office with five times the creative budget for distribution of a commercial, why can’t a content marketer get some distribution budget? The silos created early last decade are largely to blame. With the focus of content creation moving up-funnel the budgets for distribution mostly remain down-funnel. This makes no sense and is still in place at most brands today. Take some responsibility for this situation my publishing friends. Brands and marketers should be lined up begging to do long form Native Advertising with you. While many have indeed created internal agencies, or content studios, your value proposition is being sold by folks that talk impressions and clicks. You can’t expect a person who’s been selling ad impressions for 15 years to adequately communicate the value of your new content studio. You can’t expect a person who’s been selling ad impressions for 15 years to adequately communicate the value of your new content studio. You need to sell and market like a creative agency. Your prospects want engagement, subscribers, and conversions. When industry folks attend a content marketing event it should be packed full of publishers in the sponsorship hall. It’s not. Publishers need to invest in the promotion of their content studios to content marketers in a bigger way. Especially in the US. You deliver value and you should be preaching it to everyone you can. Many of the major content marketing initiatives conducted by brands today were influenced in some way by an industry thought leader. The problem is, many of these people are still preaching about what worked three years ago. Or longer. This era of exploding content makes most traditional “owned” media strategies obsolete. Unfortunately, this “build it and they will come” inbound marketing philosophy is extremely difficult to pull off today. It’s risky and expensive, depending on your industry. Last decade, many of these thought leaders flourished in a time of content deficits in our industry. They were working in unsaturated niches. Most mainstream industries today are in an era of content surpluses, AKA Content Shock. This era of exploding content makes most traditional “owned” media strategies obsolete. Thought leaders can talk story-telling strategy and content quality until they’re blue in the face, but if that conversation doesn’t include earned and/or paid media for content distribution, they’re giving terrible advice for most of their customers. Whether you like it or not, your budgets are moving up-funnel. Facebook and the rest of the Native Ad tech landscape are making sure of that. With content creation aligning with the buyer’s journey and moving up-funnel for many brands, it’s just a matter of time until the paid channels of distribution do the same. Native is the best-paid channel for top-funnel content. I predict much of its future growth will come from content marketers. According to a recent study by eMarketer, US native ad spend will make up nearly 53% of all digital display ad spending in the US this year. AdYouLike estimates that global native ad spending will surpass $59 billion in 2018. To truly embrace these macroeconomic forces your KPIs must change. Media buying and creative must work more closely together to accomplish engagement and conversion goals. The wall between media buying and the content marketing team must come down for this to happen. The good news is that we’re still in the infancy of what Native Advertising will become. Change can be difficult at first, but this is the channel of the future for our top funnel content. Whether the players I’ve mentioned embrace the change or not, they must be prepared for it if they wish to succeed. This, in part, requires understanding and demystifying the Native Advertising technology landscape. Start now. Hope you enjoyed your drink. This article originally appeared on Businessgrow.com and has been reprinted here with permission.